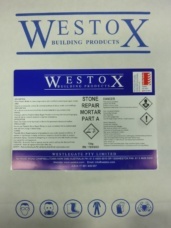 Used to repair broken and delaminated stone or render mouldings on horizontal, vertical or over head surfaces. Two part acrylic modified mortar. 12m2 per 20kg kit @ 1mm thick. Intital Set Time 2hrs / Full 8hrs. Available in Part A – 15kg, Part B Mortar Modifier 5kg.